One kiss can change the course of destiny...When ace accountant Sara Keegan decides to settle down and run her quirky aunt's New Age bookstore, she's not looking for adventure. She doesn't believe in fate or the magic of tarot cards, but when she's saved from a vicious attack by a man who has the ability to turn into a fire-breathing dragon, she questions whether she's losing her mind - or about to lose her heart.Self-reliant loner Quinn Tyrrell has long been distrustful of his fellow Pyr. When he feels the firestorm that signals his destined mate, he's determined to protect and possess Sara, regardless of the cost. Then Sara's true destiny is revealed and Quinn realizes he must risk everything - even Sara's love - to fulfill their entwined fates. http://StormyVixen.booklikes.com Stormy Vixen's Book Reviews 5.0 Release Day Review! Kiss of Fire (DragonFire #1) Deborah Cooke! text Release Day Review! 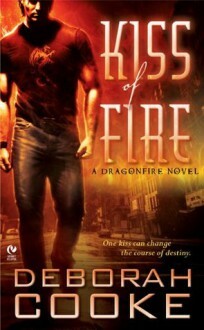 Kiss of Fire (DragonFire #1) Deborah Cooke! CH 1 fails; May 4, 2014Ever heard "When an author introduces too many characters at once."? This book is exactly THAT description. It's a major book turn off. Bye.